Immigration is currently a topic of paramount importance nationally, and in New Mexico. In response to ongoing concerns and questions, Temple Beth-El is pleased to present a two-part series on Immigration. The program will take place at 7:00–9:00 pm on two consecutive Wednesday evenings, February 6, 2019 and February 13, 2019 at Temple Beth-El, 3980 Sonoma Springs Avenue. On the first evening, February 6, Nan Rubin from KTAL radio will make a presentation focused on immigration and the involvement of Emma Lazarus, author of the poem The New Colossus, mounted on the base of the Statue of Liberty. 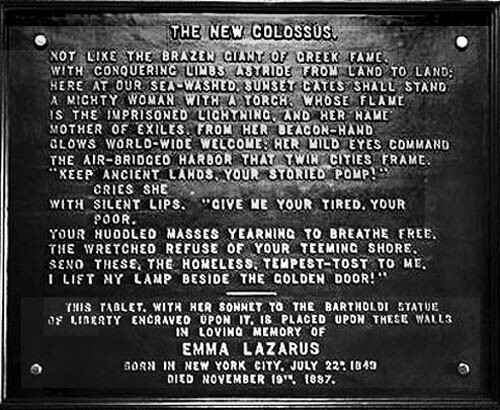 Participants will learn about Emma Lazarus’ involvement with United States immigration in the late 1800’s while also hearing and examining her poem and its meanings as it changed over time.